Dogs may be man´s best friend, but only two or three generations ago another four-legged friend was absolutely essential on so many levels: the horse. Different breeds of horses were everywhere, not only in the country, but in the city as well. Horsepower was needed for transporting people and goods, in farming, the army, the industry, and so on. The Heathcote Hunting Group, painted in 1790 by Daniel Gardner (1750-1805). It shows the Rev. William Heathcote (1772–1802), on horseback (son of the 3rd Baronet) with company. Following photos courtesy of Maria del Carmen. Amiring the estate. Yours truly was practically brought up in the saddle. Not. Please overlook any historical inacurracies regarding the horse tack. Fooling around with a crow. 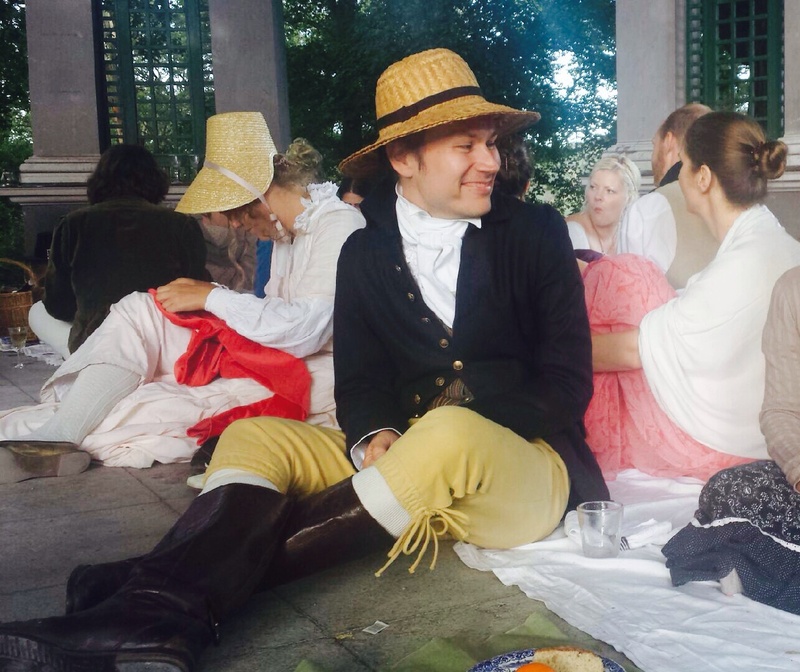 I started the session wearing a rather loose-fitting 1750´s outfit. It was an interesting experience to mount a horse dressed in full Regency attire. However comfortable they are the clothes restrict one´s movements. It is practically impossibe to sit like haysack in them. It was also fun to observe the group of horses in the adjoining paddock. They followed every step we took and listened to our attacks of giggles, in full astonishment. Apparently we were an unsusual sight! I had a wonderful day with Helena, Maria, Caroline, and Diva. Last week I pulled myself together and finally finished the boots. The project has been on hold, with the almost demolished boots tucked away deep in my closet since before the summer. I had to construct a feasible plan in my head. I started with this, remember? 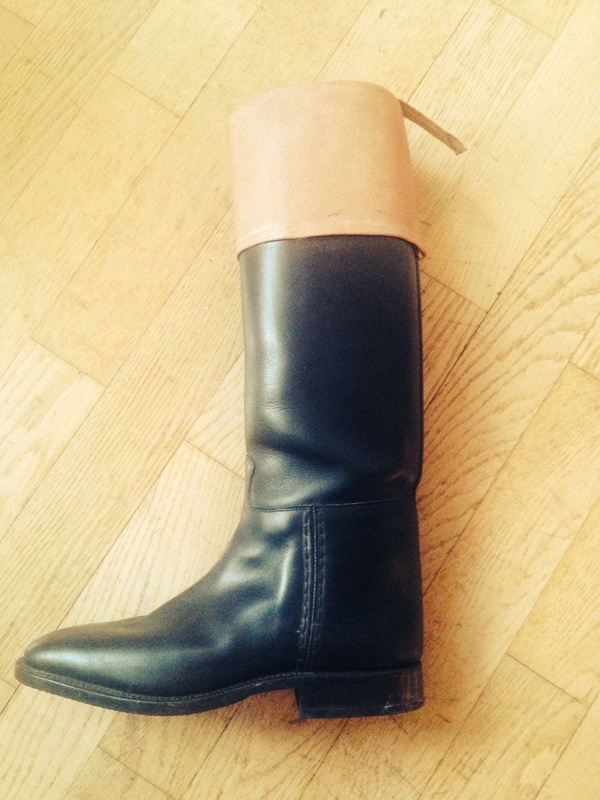 A pair of classic Koenig’s riding boots crafted in fine calf leather. Right size for my feet but a good two inches too tall. Really nothing wrong with them, but not Regency. This is how got I started. 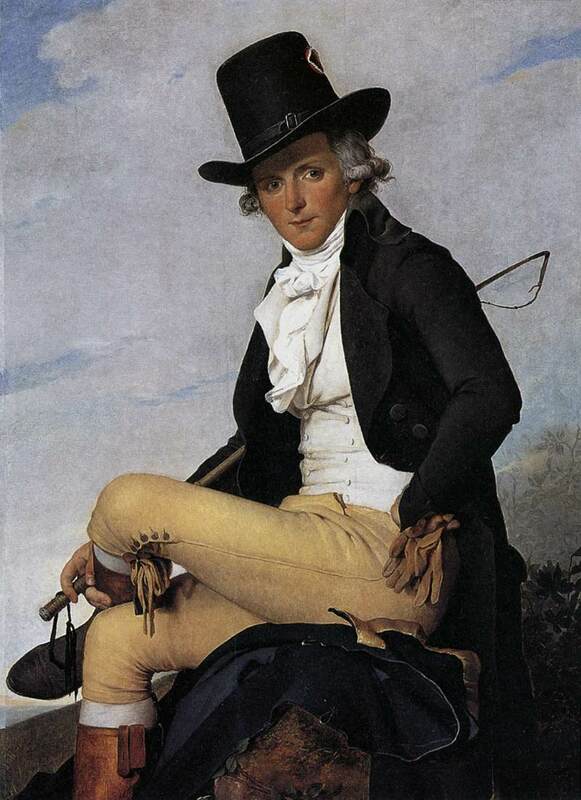 Relatively little is written about them online (unless you are involved in hunting and riding) but they are seen in so many portraits and fashion plates. They are known as top boots or hunt boots. 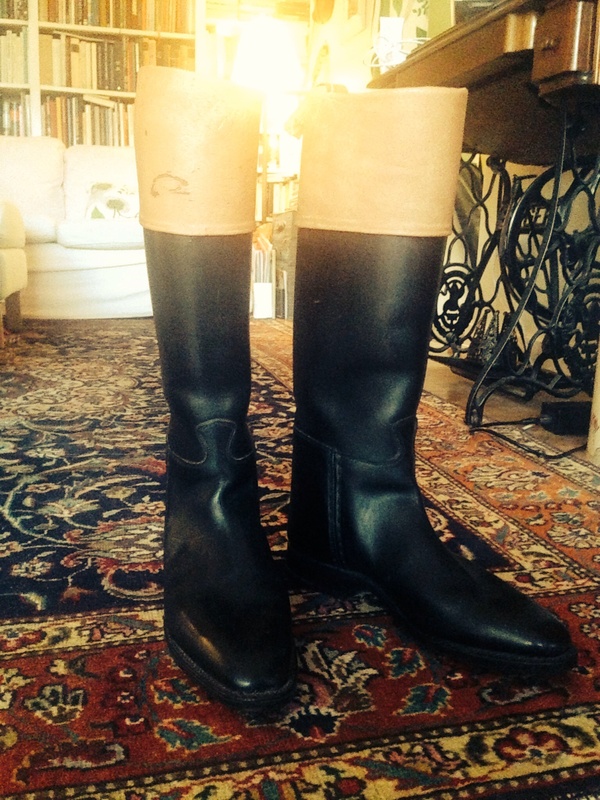 They are distinguished from other riding boots by the top that is turned down to reveal a lighter coloured leather. Today this type of boot is the correct wear on ceremonial fox-hunts and such. Other Regency boots are of course the famed Hessians and later on the Wellingtons. My plan was to look for cheap second-hand boots and cut off the tops, but quite recently I remembered there were some discarded cuts of tan leather in our stash. (A medieval shoe-project years ago, but originally a 1970s skirt.) After a lot of debating whether there was enough – this is what took time, pieces were very odd with stains and tears – I finally came to the decision to go for it. And actually it could not have been simpler. I had dreaded the hand-sewing, but needed only one seam per cuff, and could use the holes made by the original seams. The seams along the edges are not supposed to be visible, so I took a shortcut and simply glued them. Then pulled the cuffs on the boots, and they fit perfectly. Folded the top to the inside of the boot and attached it with glue (while watching the Nobel-prize festivities on television, it was 10 December). Finished off with a quality shoe polish (I can recommend Kiwi Shoe Polish), black for the boot and medium brown for the cuffs. Three coats darkened the cuffs to the desired effect. See? 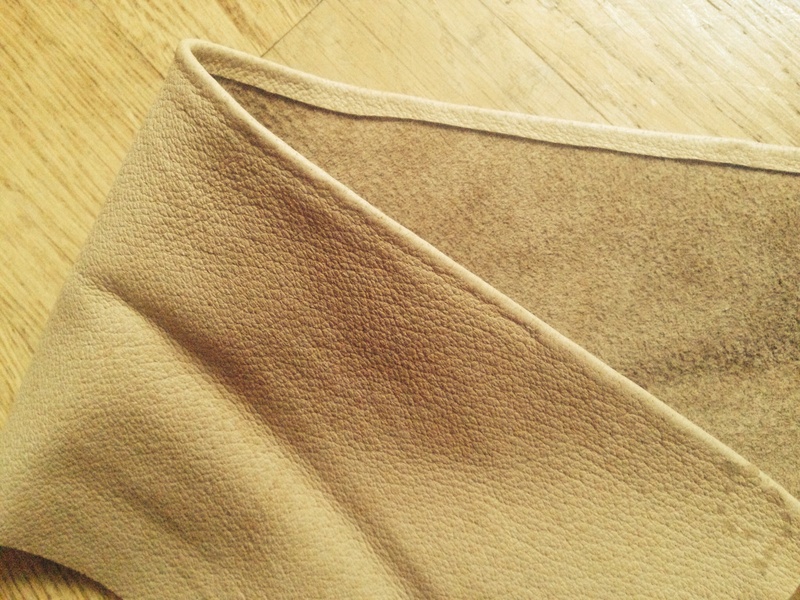 Scraps of very light shade of tan leather might work? I was able to sew along the original seams, so it wasn´t that difficult after all. This is the wrong side. The seams along the bottom edges are not supposed to be visible, so I simply glued them. I used Casco Contact adhesive, suitable for leather, textile, plastic, etc. 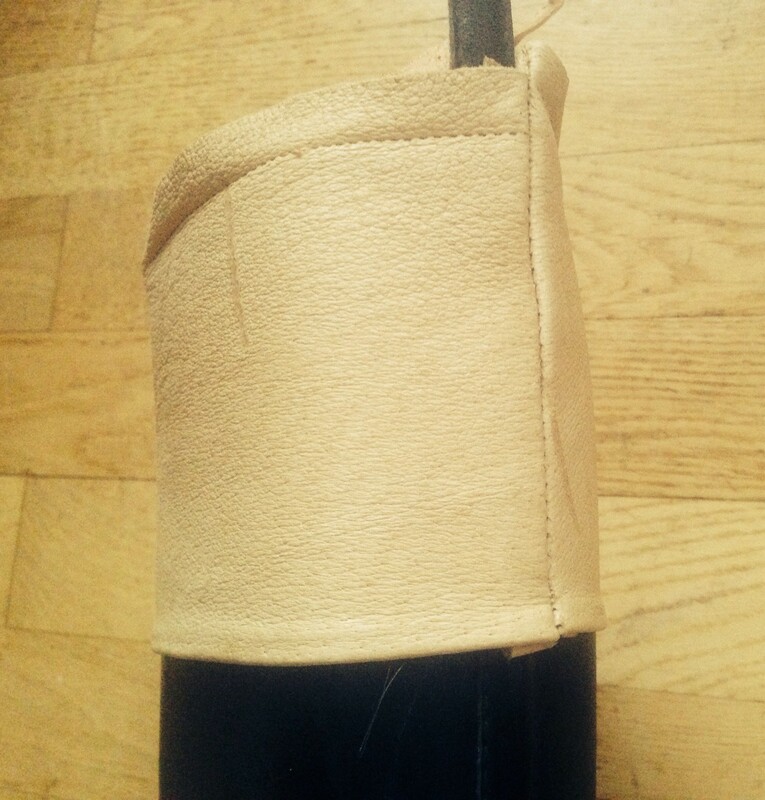 The tight cuff is pulled on to the boot. It is about 5 inches (12 cm) wide. The seam is positioned at the middle back. The top is folded over and glued to the inside of the boot. Almost done. They need a good coat of polish. Sorry for the bad photo, but it was a gloomy day. The difficult part was actually cutting off the tops evenly, since the boots had curved tops. The raw edges are now covered by the new cuffs. They are not perfect, but any unevenness will be hidden by stockings and breeches. So now I have a decent pair of boots, without going bankrupt. And of course I found use for them this past weekend. A new post is coming up later this week! If you are interested in making yourself a pair of Hessians, there is an excellent tutorial over at My Darling Dear and the Regency. P.D. James wrote the novel and it was adapted for television earlier this year. The main plot is, as the title reveals, a murder. Who did it? And why? Who is that mysterious lady in Lambton? There are many comments and reviews out there, both regarding the book and the adaptation. They are very mixed. Some of you like the plot, some of you don´t. Some of you enjoyed meeting Darcy and Lizzie again, some of you, well, did not. I have not read the book but watched the two part series recently. It is undoubtedly a lavish production with magnificent Chatsworth House with its gardens as the exterior of Pemberley. The interiors were filmed at Castle Howard (also known as “Brideshead”), another stunning palace up North in Yorkshire. 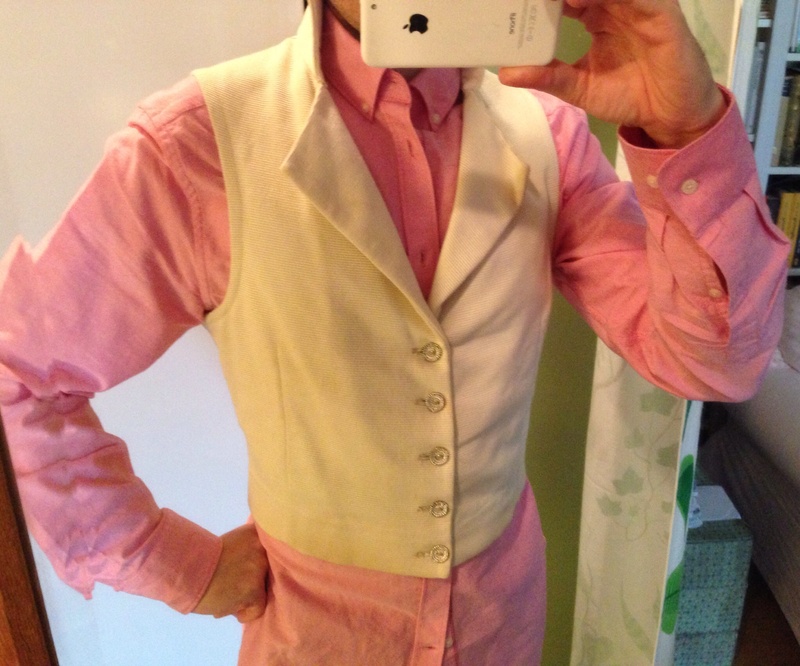 This post takes a look at the costumes worn by the gentlemen in the adaptation. I do not intend to comment on the actors and their performances, or the anachronisms seen here and there. 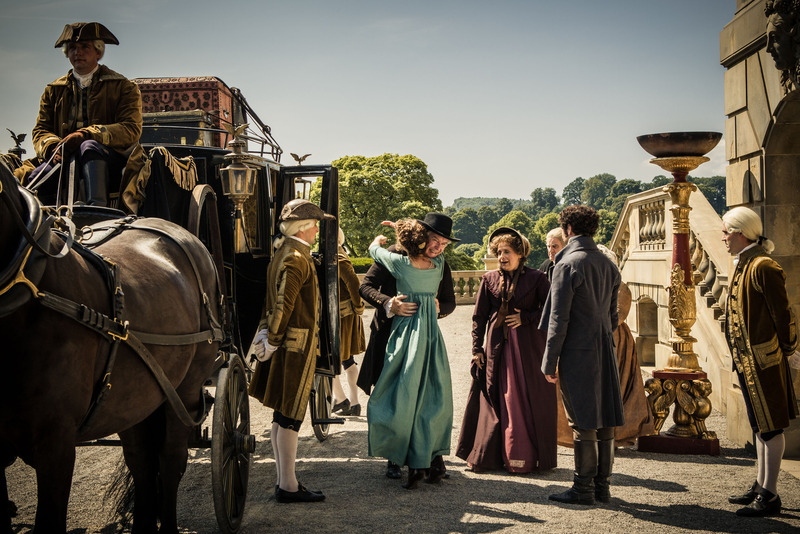 The costumes were designed by Marianne Agertoft (Poldark). Many of them were created especially for DCTP, while others were recycled from earlier productions. 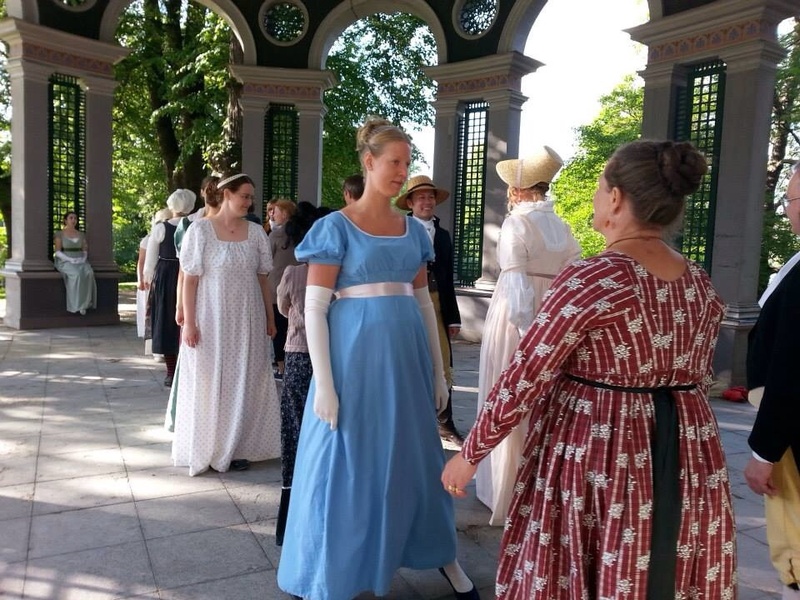 The story is set in 1803, so we see mainly early Regency fashions and some late Georgian costumes on the older characters. (Penelope Keith as Lady Catherine de Bourgh comes to my mind. We have seen that in other Austen-adaptations.) The costumes are in muted colours and have that “lived in” look. I like that. 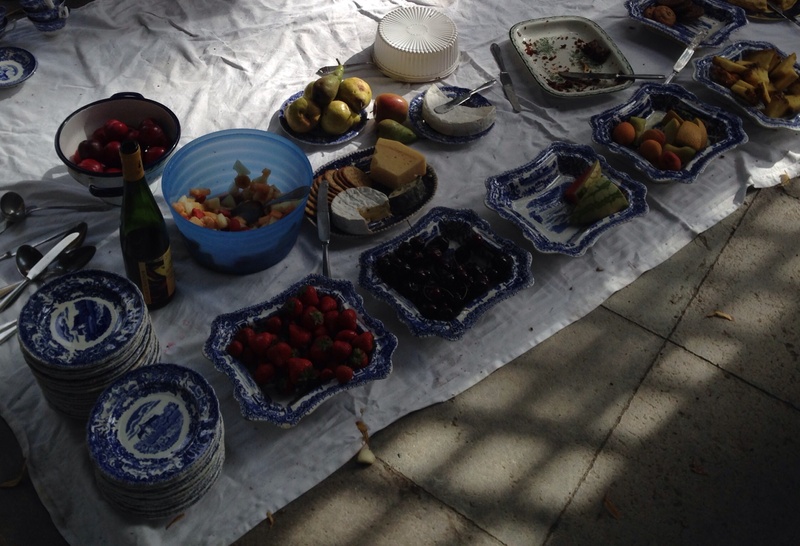 However I feel they aren´t always grand or varied enough for people living in a place like Pemberley. They are supposed to be members of the landed aristocracy! Mrs. Darcy probably owns several gowns (very nice too) but they all look similar. 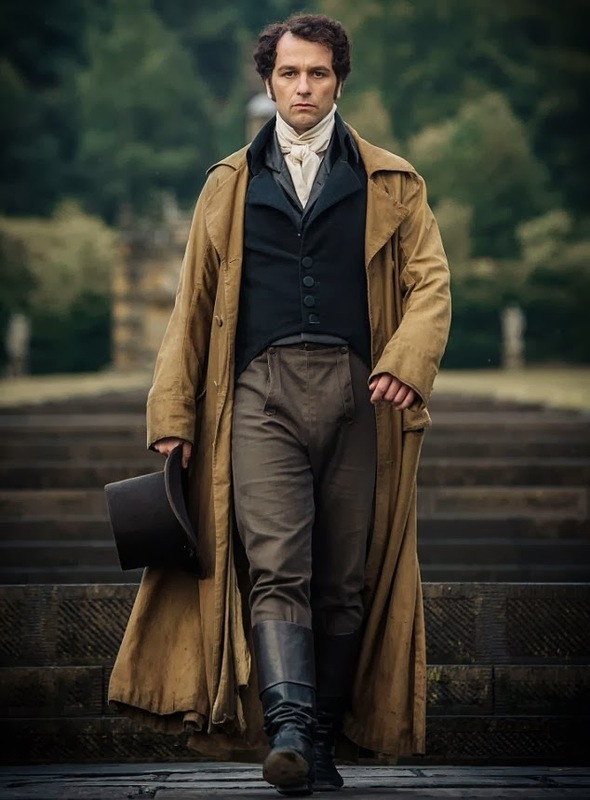 Some of you out there might even think that the shades of Pemberley are polluted by shabby looking impersonators. But I think we can all agree that there is a lot more publicity shots nowadays, which is good for costume-bloggers like us. Fitzwilliam and Elizabeth Darcy, played by Matthew Rhys and Anna Maxwell Martin. 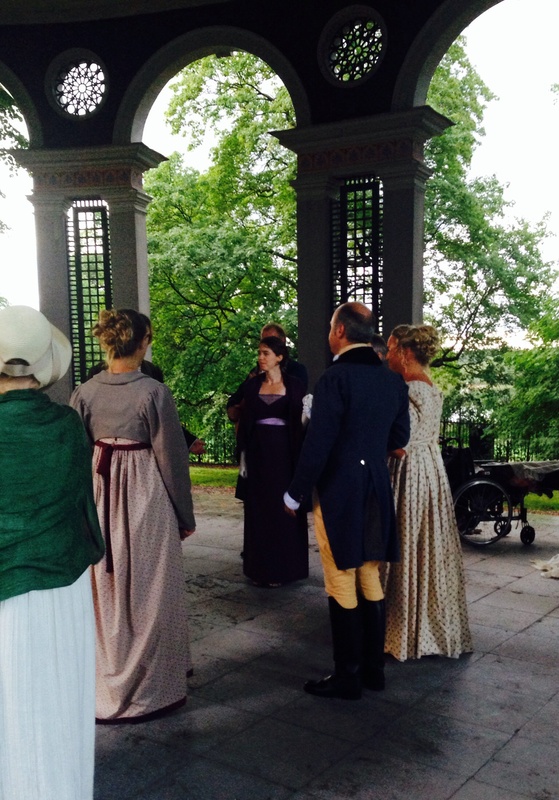 The mistress of Pemberley greets her dear papa and mama, the Bennets. 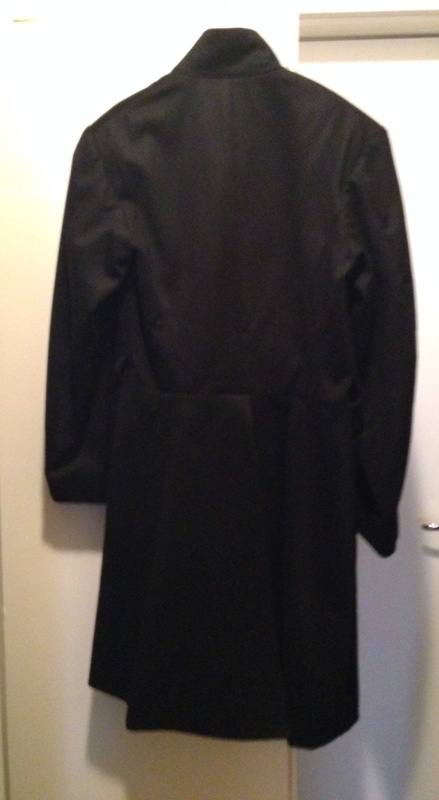 Darcy is standing to the right, showing the back of his tailcoat. 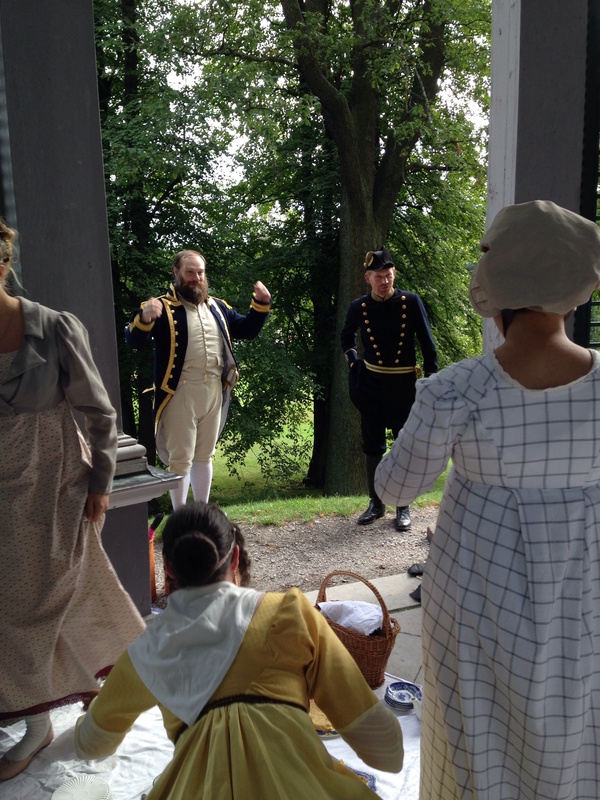 The footmen are decked out in liveries in what would be the Darcy-colours. It was important to separate family and guests from servants, so the butler and footmen of the Regency era would be dressed in ornate coats, waistcoats, and breeches but in a style that was fashionable several decades earlier. Hence the powdered wigs. Observe Mrs. B:s fancy trunk up on the carriage top. Stunning publicity still. Georgiana Darcy (Eleanor Tomlinson) out walking with young Henry Alveston (James Norton). Sombre colours. Nice top hat and overcoat. Also nice to see some colour on a Regency lady. 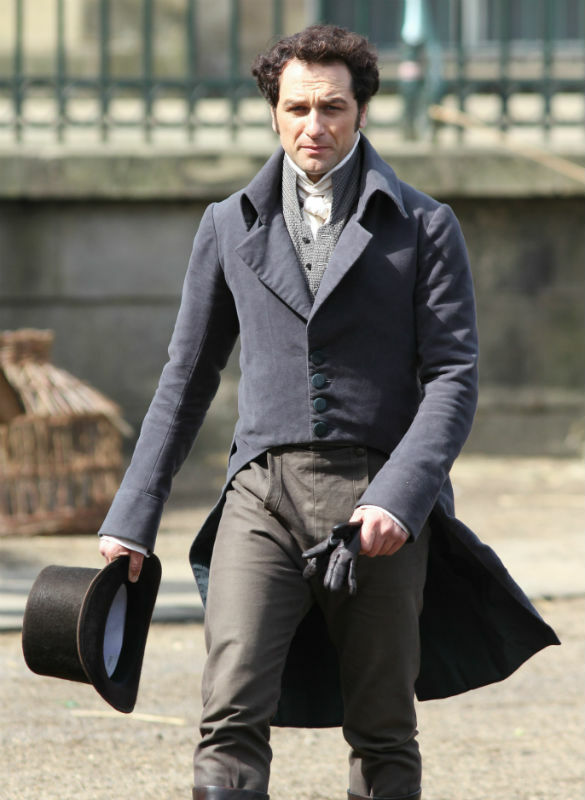 Matthew Rhys as Mr. Darcy, in same tailcoat, trousers and boots, but different waistcoat and without the coat. Hat and gloves. Nice tailcoat. Looks very comfortable. I can see myself in it. 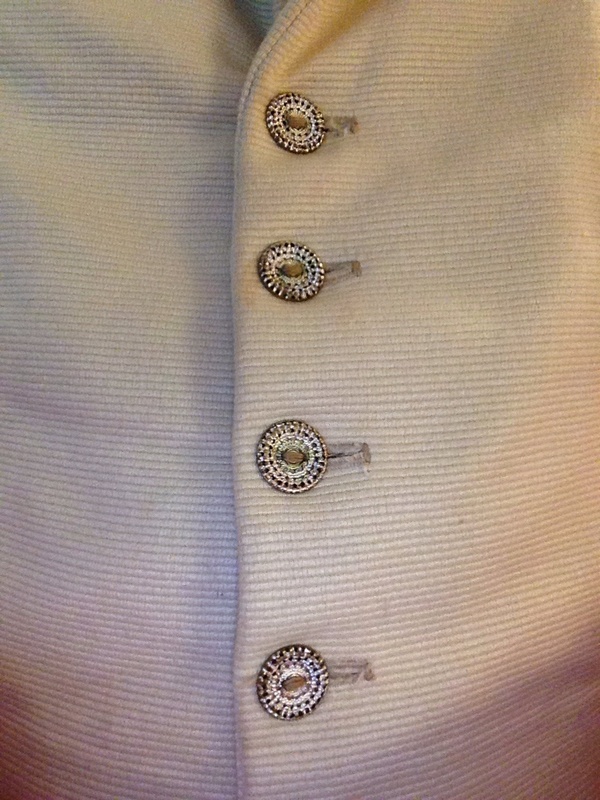 Unpadded shoulders, wide lapels (the bubbles along the edge indicates hand stitches), narrow sleeves, selfcovered buttons. 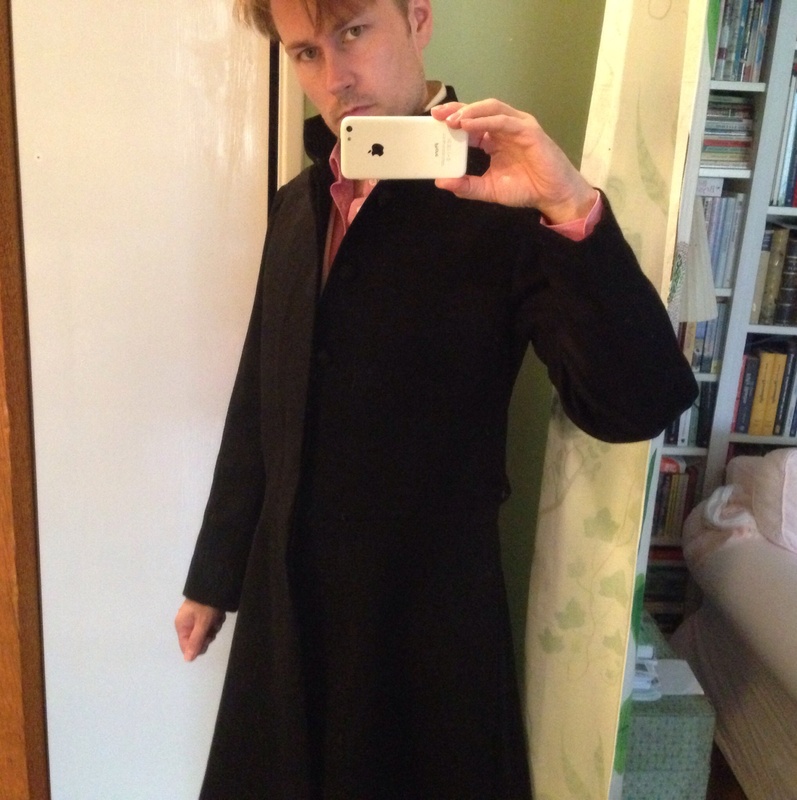 I am sure Mr. Darcy would be in possession of more than the one coat, though. Yes, there is a death. Is it murder? 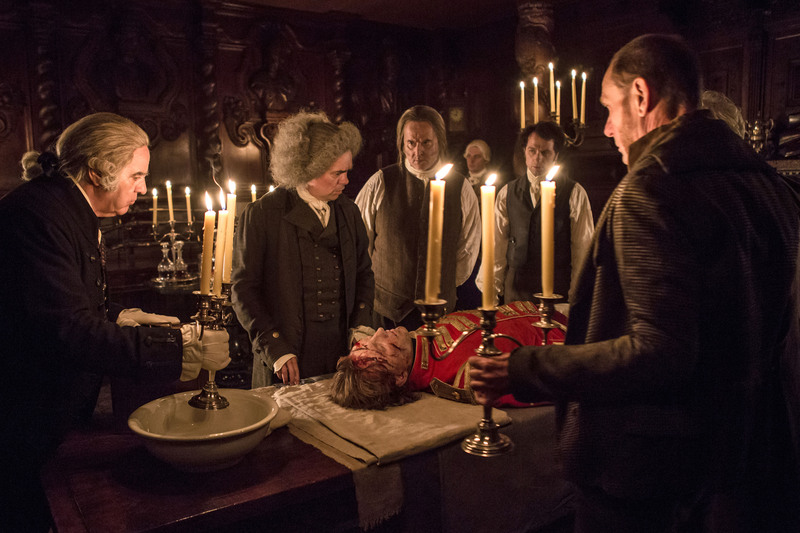 I like the wigs on the doctor and the other older gents. 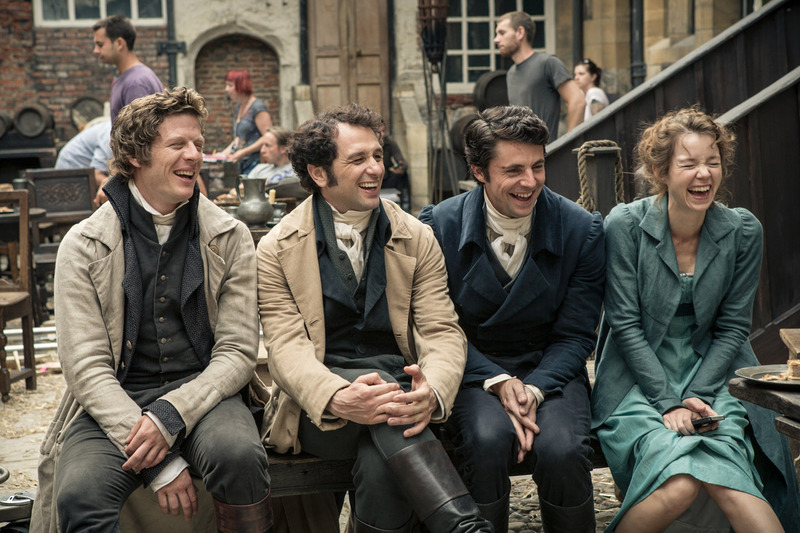 Members of the cast during filming. A good picture for compairing details on coats and waistcoats. The gentlemen have a lot of hair and many layers of clothes. Must have been warm – notice crew in the background wearing t-shirts. 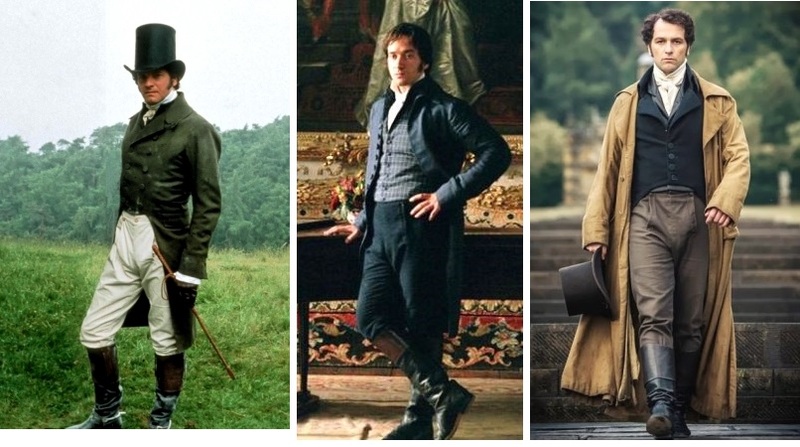 And finally, three versions of Mr. Darcy, all in similar outfits. Colin Firth 1995, Matthew Macfadyen 2005 and Matthew Rhys 2014. Do you have a favourite? Sometimes I forgo my principles. Like this week when I bought ready made clothes. (Yes, why make life complicated, you might think!) 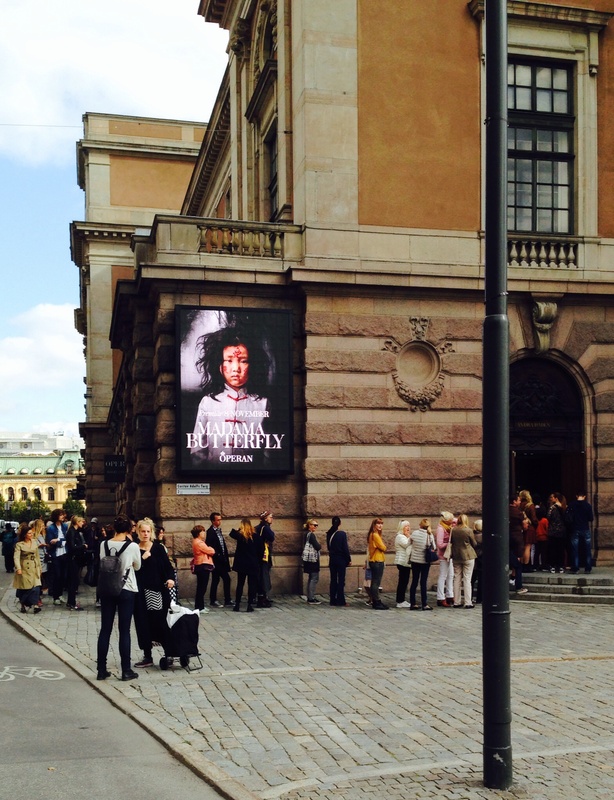 It all started when the costume department at the Royal Opera in Stockholm announced a sale of a large number of costumes, in fact the largest ever. It was everywhere in the morning shows and the papers, which meant that uncountable costumiers, reenactors, bloggers, theatre enthusiasts and others would try their luck. So did I, hoping to find a decent hat and perhaps a waistcoat. I left for an early lunch break and joined the crowds. The grand foyer was filled with row upon row of garments hanging on tidily labelled racks. I spotted all sorts of clothes from magnificent Renaissance costumes to ordinary t-shirts and chinos. 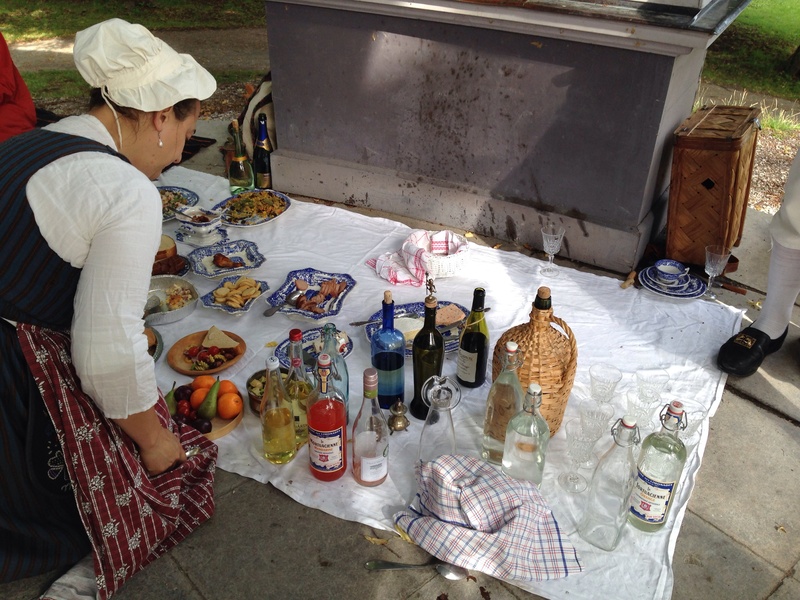 It was a bonus to meet several friends and acquaintances, and we compared our lucky finds. 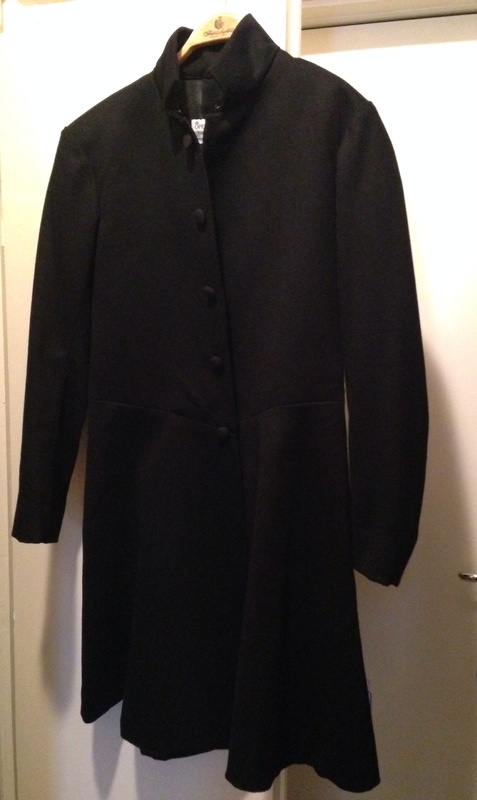 I did find a terrific black wool coat that could be everything from 18th century to late Victorian (depending on styling). (It was actually designed in 2009 for a modern/fantasy/half-period version of Verdi’s opera Macbeth.) I have not decided what to do with it. It might not even enter the Regency wardrobe. But in excellent condition and only £19! 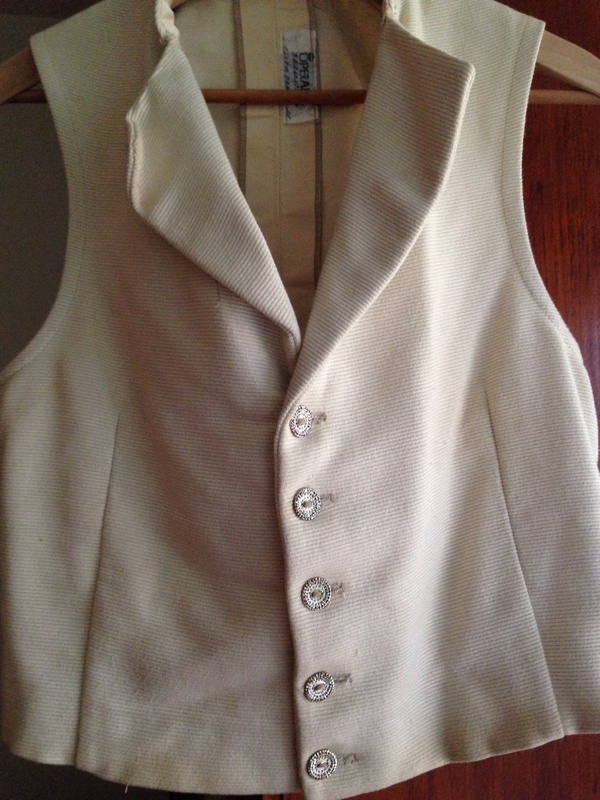 What I most definitely will be using with Regency attire is a lovely cream coloured waistcoat in uncut velvet and silk moire with gilt buttons. The label reveals it was designed in the 1980’s for a ballet production of the classic Swedish novel, Gösta Berling’s Saga. 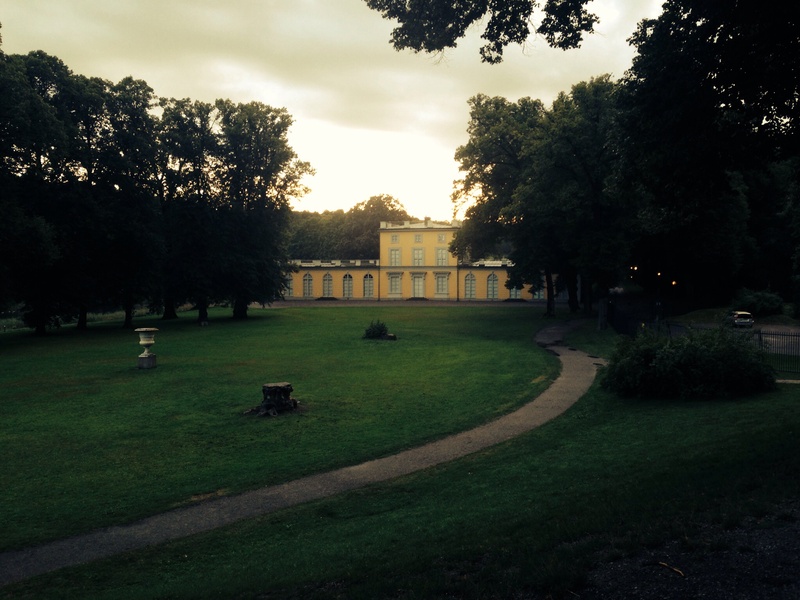 The story is set in a country house in the 1820’s. (Trivia: The book was filmed in 1924 with a young Greta Garbo, just before she left for Hollywood.) It shows signs of wear an needs cleaning but still worth more than the £5 I paid! Posing in the waistcoat. Ignore the shirt in all its pinkishness and everything else that is going on in this photo. 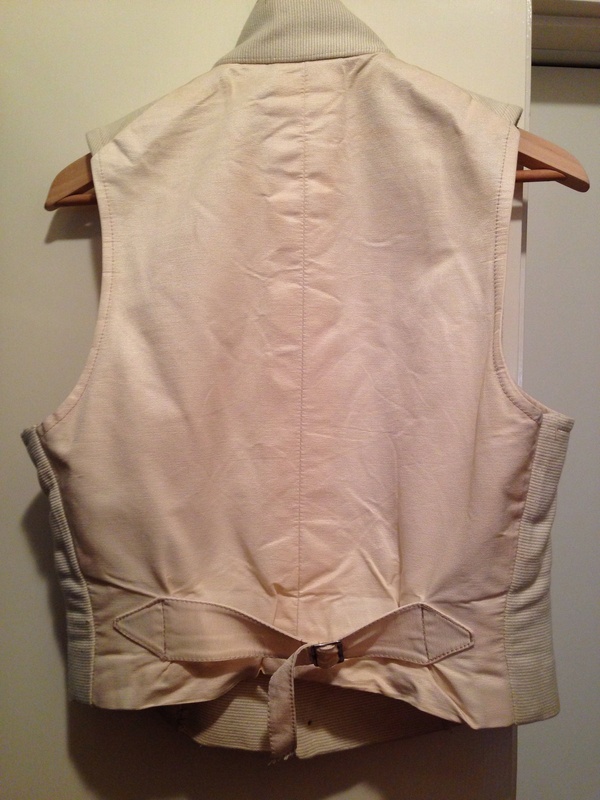 Back view of the waistcoat. Notice well made strap. Closeup of the lovely buttons. I was lucky in the shoe department as well! Three (3!) 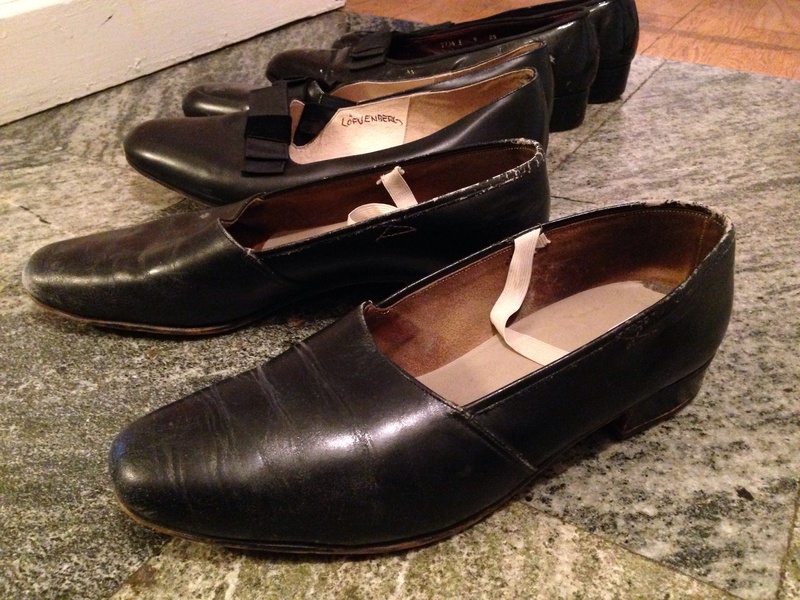 pairs of vintage leather opera pumps/court shoes in my size for less than what I pay for cake and a pot of tea! A shopping spree of fenomenal dimensions (for being me)! Opera pumps. The finest of the three, but also the most worn. 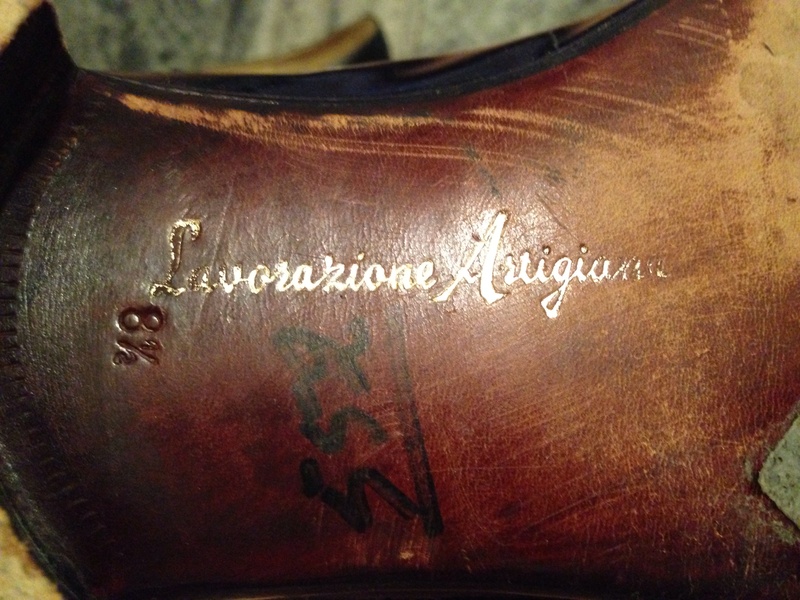 Labelled “Lavorazione Artigiana” (hand made) on the leather sole. Opera pumps # 2. The newest pair. Might sell them. Pair # 3. Seems to be the oldest pair. No bow, and really not opera pumps but have a Regency feel to them. Do you agree? A Regency gentleman could not walk on earth without a pair of boots. They are part of the fashionable silhouette, together with the coat, waistcoat, cravat and some type of breeches/pantaloons. The boot is a result of the lifestyle of the era – the military uniform or the practical country squire on horseback. 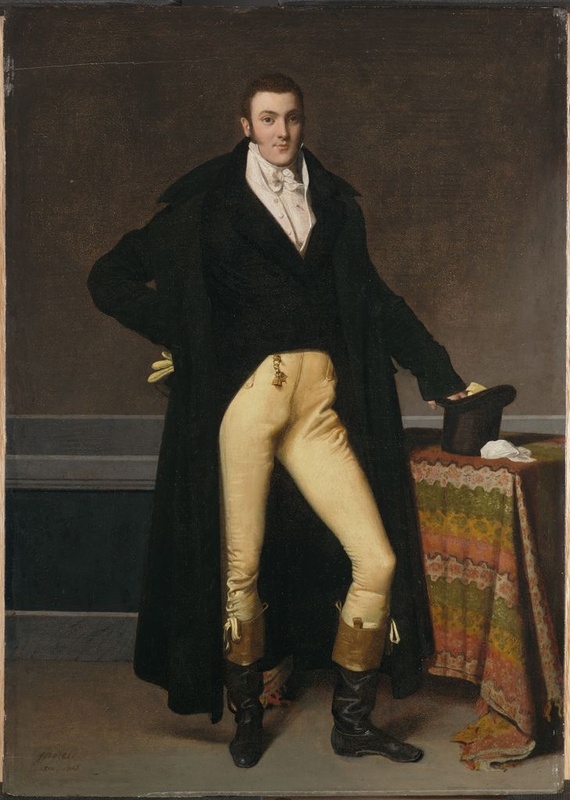 The sensible and well tailored English gentleman became a fashion icon during the years leading up to the French revolution and continued to be popular in the following century (and still is?). A gentleman would wear his boots both in town and country – almost everywhere but on the most formal of occasions. For the dapper middle class man in the city the sporty look would suggest a country seat in the family. There are two categories of boots: the top boot and the Hessian. The top boot is either tall or a bit shorter and is characterized by folded down brown or buff calf leather on the shaft. These are seen in many portraits and fashion plates, including the portrait of Monsieur Seriziat, my main inspiration. The other type, the Hessian, has its origin in the uniform of the Hessian army. A boot entirely in black finished at the top in a heart shape with a tassel right in front of the knee (see fashion plate below). 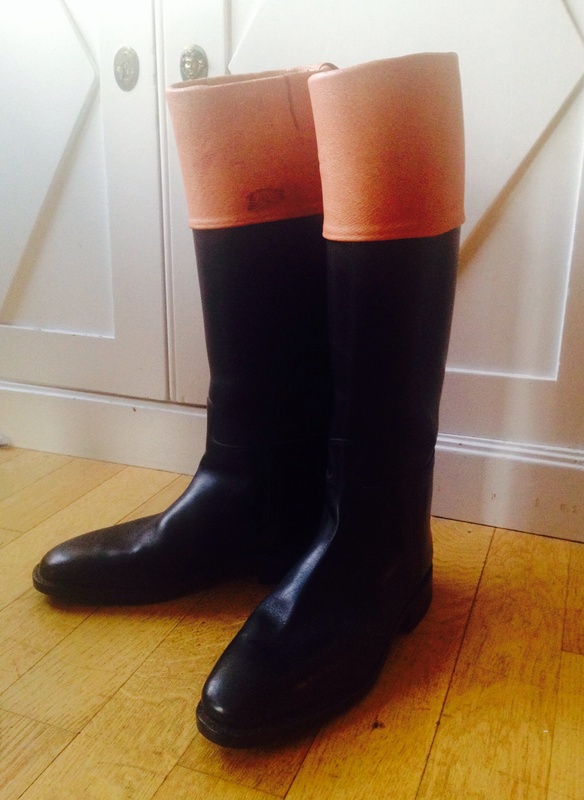 The all-black riding boot, or Wellington, appears in the 1810´s, if I understand it correctly. I have started to experiment with the modern boots from Koenig. I found them online for a very good price, so I was only a bit hesitant to cut in them. I masked off a line with tape, and cut through the outer layer with a knife. 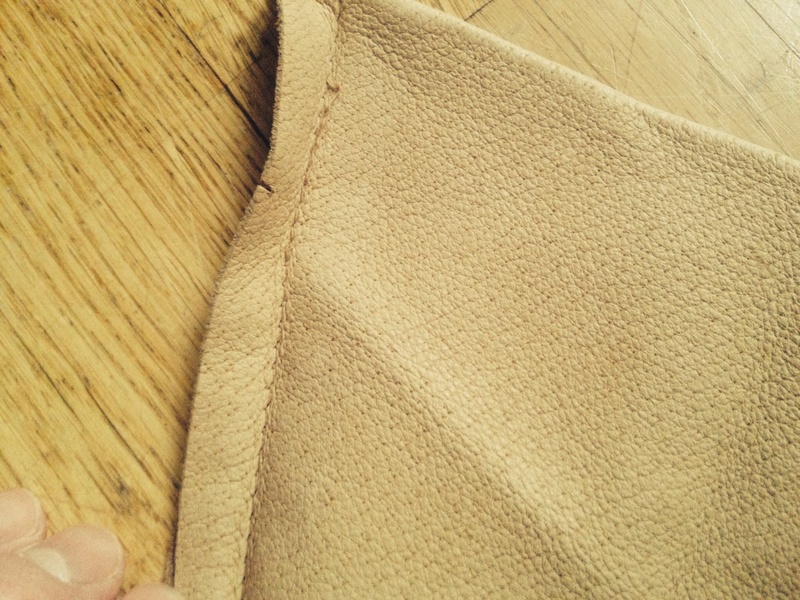 The inner layer is calf skin and perhaps there is enough to fold down on the outside? It could work. 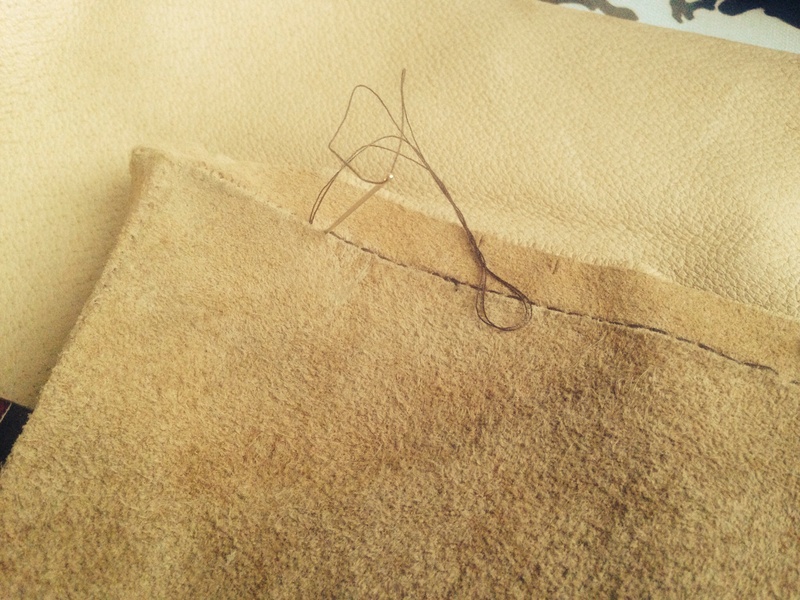 It´s a whole new project to search for additional pieces of leather that don´t cost a fortune, so preferably not. The cobbler? Flea market boots/bags/jackets? The boots are my size in the foot but man are they tall! What a difference to cut off two inches. Much easier to move about in them. (And yes I know from experienced horse-people that riding boots are supposed to be broken in and moulded to the wearer´s legs. It is sort of difficult to combine this process with every day life.) Update: I also removed the (plastic) boning in the middle back seam on the shaft. It was easy once i cut off the boot-top. Boots during the Regency era seem to be somewhat softer than the stiff modern riding boot. We have shoes! 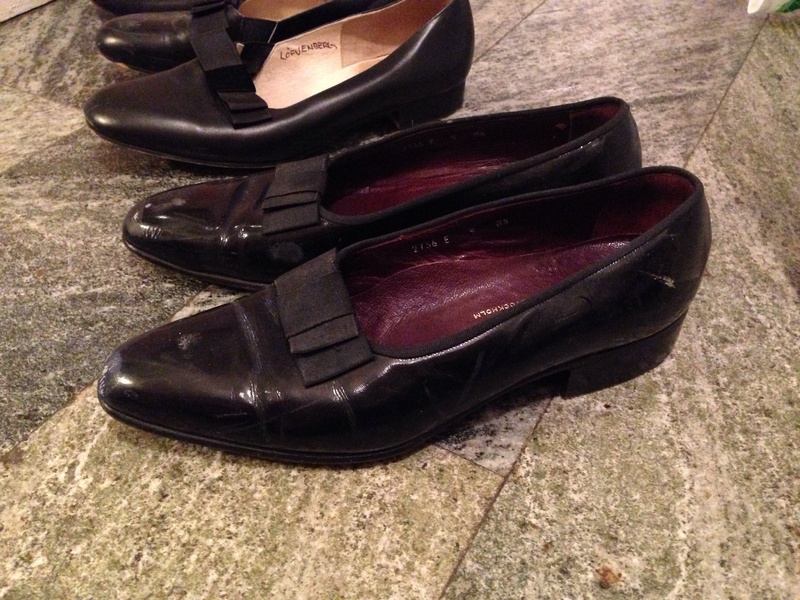 Or rather opera pumps – correct footwear with full dress. Mrs Elton was about to order new ball slippers from her supplier in the UK: Evans. 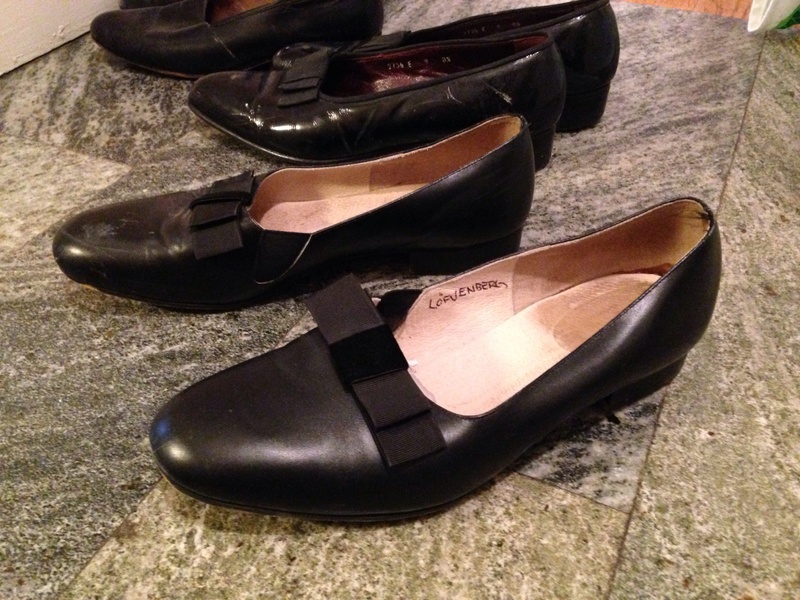 They happen to sell shoes for the longer and wider foot, so I decided to join her in ordering black “ballerina pumps”, size 8. Only £19 and quick delivery! I removed the frivolous flowers and replaced them with masculine grosgrain ribbons. 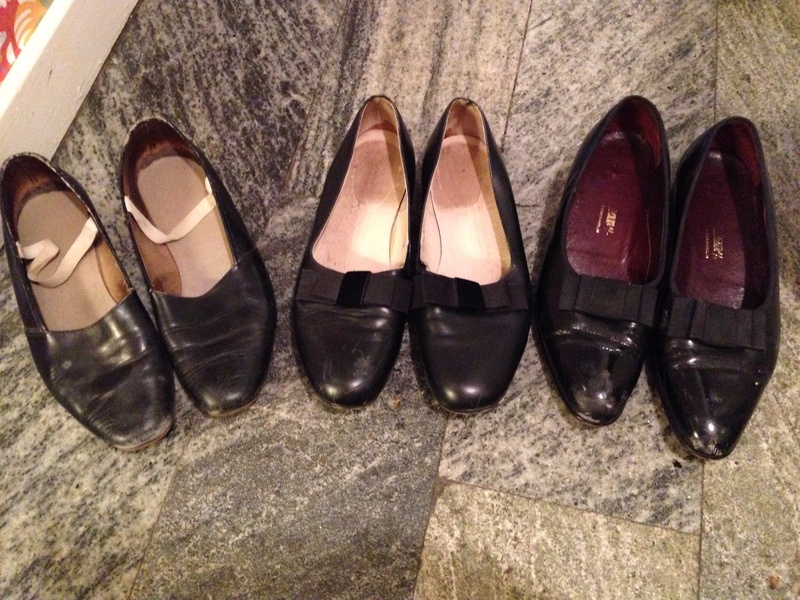 (I also found a pair of brass buckles in our stash and they could´ve worked but they actually made the shoes look more ladylike and store bought.) Perfect for elegant dancing! Read more about footwear during the Regency period here and here. Stockings: I ordered white cotton stockings from an online shop for traditional folk wear: Hemslöjden in Linköping. SEK130 (or £11) for one pair. Very comfortable but they have an unfortunate, striped effect. Might not use them if I find alternatives.